It's pie season! Really though, every season is pie season, but there's something about fall and cozy sweaters and double Thanksgiving celebrations (yay Canadians living in America!) that brings my pie dish out of hibernation. I never actually used to like pie. 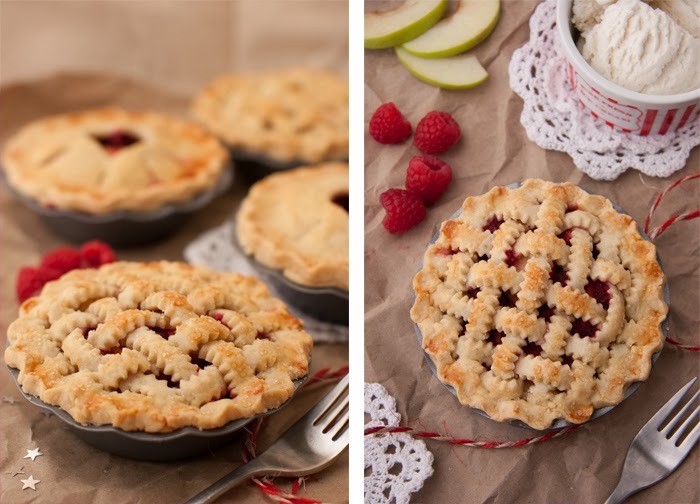 Maybe it's because most of the fruit pies I tried were sickly sweet or filled with unidentifiable goo (aka store bought pie filling) but once I finally learned to make my own, everything changed. This pie is made with tart granny smith apples sprinkled with lemon juice and a little brown sugar & cinnamon. We also added in some fresh picked raspberries (see Berry Picking Adventure) and topped the homemade crust with some crunchy turbinado sugar. Add a little vanilla ice cream on the side and it's the perfect combination of sweet and tart. 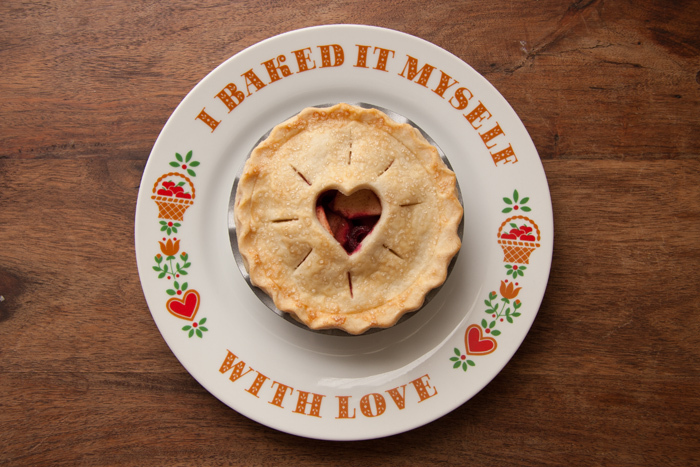 We decided to make mini pies because they're super cute - and who doesn't want a whole pie to themselves? Get ready to impress your guests - and your mouth. Pie crust is one of those things that seems daunting to make but once you do it you realize how easy (and delicious) it is. Plus, this same recipe can be used for all kinds of dessert pies, quiches, chicken pot pies - you name it! Because my mini pie dishes came in a set of four, we're going to make enough pie dough for 4 mini pies with top & bottom crusts. That means you're going to make this recipe twice. I use a food processor to make my pie dough and it's not big enough to hold double the ingredients but if you have a giant one feel free to go ahead and double it from the beginning. *Note: Make sure you pay attention when you're measuring out your ingredients so that you don't end up having to throw it all out & start over because you were talking to Amanda. 1. First, take your butter and chop it into small cubes and place in a dish in the freezer. You want to keep your butter super cold until you're ready to use it. (This keeps the butter from melting so that when you cut it into your flour it stays in tiny hard pieces. When your pie is baking, these pieces will melt & produce air pockets which creates that delicious flakiness in your pie crust). 2. In a large bowl (or food processor) combine flour & salt. Mix well. 3. Now take your butter from the freezer and cut it into the flour/salt until the mixture resembles coarse crumbs. (If using food processor press "pulse" button until you reach the desired consistency). 4. Next, add the ice water (we use ice water so it doesn't melt the butter) a tablespoon at a time just until the mixture starts to come together. Test your dough. When you can form it into a ball without it falling apart it's done. You may not need all the water, you may need a little extra - this is one of those baking things where you just have to play it by ear. 5. Take your dough out and lightly form it into 4 separate balls (if you doubled the recipe, divide into 8). Wrap in plastic wrap and refrigerate. A lot of pie crust recipes ask you to refrigerate the dough for 4 hours or overnight but I just leave mine in there while I prepare the pie filling and it turns out great. So make it in advance if you want - or just leave it in there until we finish the next part! 6. If you didn't double this recipe, go back & make one more batch so that you end up with 8 dough-balls in the fridge. 2. Peel & core apples. Cut into slices and then, because we are making mini pies, chop your slices into smaller pieces. 3. Place apple slices into a bowl and squeeze a little lemon juice over top. Sprinkle with cinnamon and a little brown sugar & stir. 4. Take one of your pie crust sections out of the fridge and roll out on a lightly floured surface (about 1/4 inch thick). 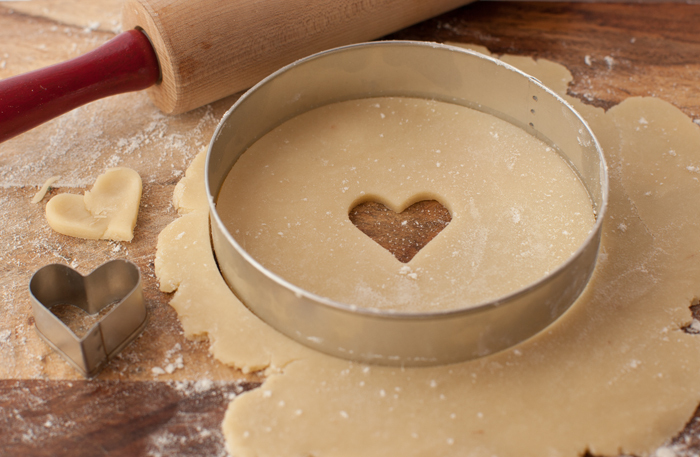 I used a large, round cookie cutter to cut out my bottom pie crust but you can use whatever you have on hand. An overturned bowl or a large teacup may work - just make sure the diameter is a little larger than your pie dish so that there's enough dough to fit. Press into pie dish. Repeat for all 4 pies. 5. 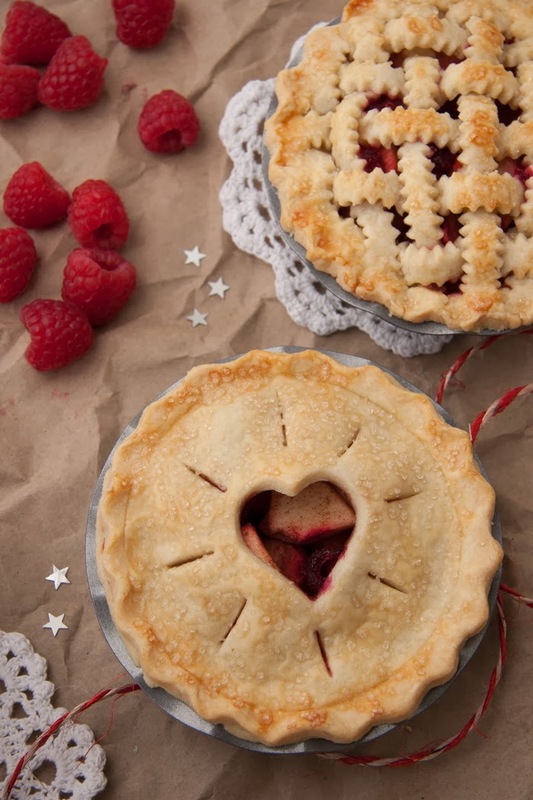 Fill pies with apple mixture (add raspberries if you desire!). Fill your pies quite full so the apples create a mound. 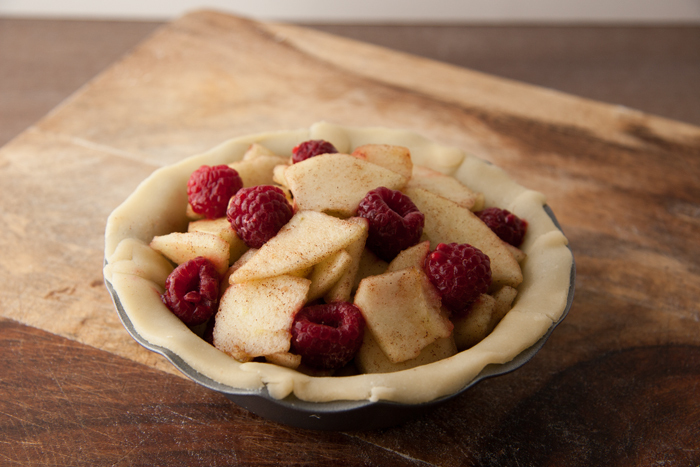 The apples will soften & shrink when cooking so filling them up prevents your pie top from sinking in. Place pies in fridge to keep the dough cool. 6. For your top crust you have options. I made two versions - one is a full top which I cut out using the same circular cookie cutter & added a little heart cutout in the center. For the other one I made a lattice crust which is done by cutting strips of dough with a pastry wheel and laying them across the top of the pie. 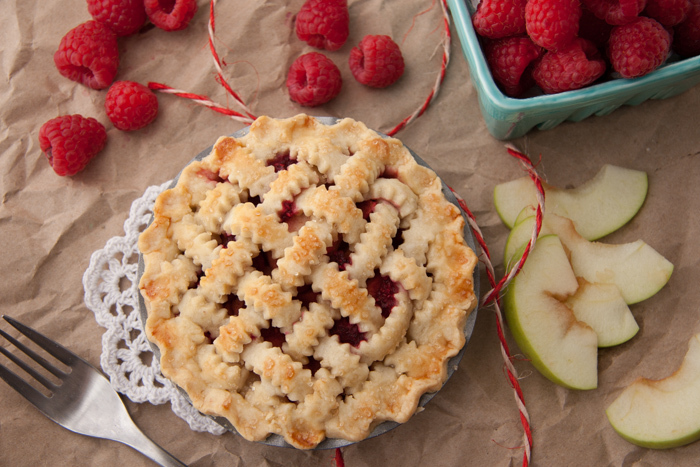 Here is a great YouTube video with instructions on how to make a beautiful lattice-top crust. 7. There are a couple ways to finish your edges and make sure your top & bottom crust stay together. I gave mine a "fluted" edge which is done by pinching the dough to create that pretty, wavy look. 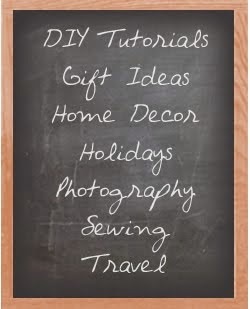 Here are some instructions and well as a couple other options for finishing your edges. 8. Optional step: To give your pies that shiny, sparkly look, beat one egg and (using a pastry brush) lightly brush over tops of pies. Then sprinkle with a coarse (turbinado) sugar. The egg wash will give your crust that shiny look and also aids in browning. 9. Now your pies are ready to bake! I found it easiest to place all 4 of my mini pie dishes on a baking sheet so that I could take them in & out of the oven at the same time. Bake at 350 degrees for about 15-20 minutes or until the tops & edges start to turn a nice golden brown. 10. Remove from oven, let cool slightly, and serve with some rich vanilla ice cream!